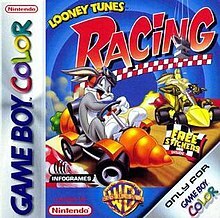 Looney Tunes Racing is a kart racing video game released for the PlayStation and Game Boy Color and published by Infogrames. It was released in 2000 in North America and in 2001 in Europe. Looney Tunes Racing features different power-ups that are slightly unusual for the genre—instead of random pickups as in most racing games, racers collect tokens of various colors which are used to charge various power-ups. Six power-ups are available, and only the current level power-up may be activated. Also available are environmental hazards, triggered by driving through an 'ACME gag-activation arch', generally aimed further ahead on the track. The game features a season ('Championship') mode with three different levels, each with four (Rascal), five (Stinker), or six (Despicable) races. All tracks are unique. Each race features six racers, and awards ten points for finishing in first place, six points for second place, and four points for third place. Finishing in fourth place or lower requires the player to use a continue (of which he or she has three) to retry the race. Winning a championship unlocks a bonus level and a character. Winning the Despicable championship also leads to either a specific ending movie (for one of the starting characters) or a generic showing of the trophy (for the hidden ones). The ending movie shows the results of your character's wish, awarded by Smokey the genie (although he always congratulates them for winning 'the race', not the series). One can race on individual tracks, unlocked once they are won in 'Championship' mode. Also found here are three bonus levels won in 'Championship' mode. These are fifteen special races divided into three 'floors' of five events each. The last event for each floor is a race on a short track against a secret character (Porky Pig, Elmer Fudd, or Gossamer). The other four events range from collecting icons (gather a certain number of icons around an arena) to racing with specific conditions (no brakes, for example) to time trials. Winning each event recovers an artifact from the museum. Each event can end with failure or a medal for success: bronze (minimum win), silver (slightly tougher), or gold (toughest). Winning a medal on each event unlocks the next floor; winning a medal on all events on the third floor unlocks the 'Challenge' ending movie, where the Acme museum is (temporarily) reopened. Two players can either race, battle, or try 'Wacky', which brings up random events for the two to try. Note that in battle mode, the two most powerful powerups are deactivated for battle events. For race events, the bonus levels are replaced by the short speedways used in the challenge events. Looney Tunes Racing features nineteen characters (six default characters and thirteen unlockable characters). The PlayStation version received "average" reviews according to video game review aggregator Metacritic. ^ Woods, Nick. "Looney Tunes Racing (PS) - Review". AllGame. Archived from the original on 2014-11-17. Retrieved 2014-11-17. ^ "Looney Tunes Racing (GBC)". Game Informer (95). March 2001. ^ Brogger, Kristian (December 2000). "Looney Tunes Racing (PS)". Game Informer (92): 111. ^ Jake The Snake (2001-01-12). "Looney Tunes Racing Review for PlayStation on GamePro.com". GamePro. Archived from the original on 2005-02-15. Retrieved 2014-05-18. ^ G-Wok (February 2001). "Looney Tunes Racing Review (PS)". Game Revolution. Retrieved 2014-05-18. ^ Provo, Frank (2001-01-17). "Looney Tunes Racing Review (GBC)". GameSpot. Retrieved 2014-05-18. ^ Satterfield, Shane (2000-10-17). "Looney Tunes Racing Review (PS)". GameSpot. Retrieved 2014-05-18. ^ Da bomb mom (2001-01-22). "Looney Tunes Racing Review on PlayStation". GameZone. Archived from the original on 2005-01-07. Retrieved 2014-05-18. ^ Harris, Craig (2001-02-07). "Looney Tunes Racing (GBC)". IGN. Retrieved 2014-05-18. ^ Cleveland, Adam (2000-11-07). "Looney Tunes Racing (PS)". IGN. Retrieved 2014-05-18. ^ "Looney Tunes Racing". Nintendo Power. 139. December 2000. ^ "Looney Tunes Racing". Official U.S. PlayStation Magazine. December 2000. ^ "Looney Tunes Racing for Game Boy Color". GameRankings. Retrieved 2014-05-18. ^ "Looney Tunes Racing for PlayStation". GameRankings. Retrieved 2014-05-18. ^ a b "Looney Tunes Racing Critic Reviews for PlayStation". Metacritic. Retrieved 2014-05-18. This page was last edited on 2 March 2019, at 22:16 (UTC).